The 1913 “Lark of the Lake” water carnival was an “extended version” of a similar event hosted by the Duluth Boat Club from 1907 to 1916. What began as a one night “Venetian Fete” grew into an annual event that drew thousands. But the 1913 Lark was arguably the biggest ever held, with activities planned for every weekend from June 27 to August 2. Its biggest draw was that flying boat. The boat was actually a Benoist Model XIV hydroaeroplane. A biplane whose front fuselage was designed as a boat’s hull, it was powered by a two-stroke, six-cylinder engine capable of 75 horsepower and speeds of 65 miles per hour. It weighed 1,250 pounds, stretched 26 feet in length and had a wingspan of 44 feet. The boat’s official name was Benoist No. 43, but it would become better known in the Zenith City as the Lark of Duluth. On May 9 of that year, local newspapers announced that William D. “Gasoline Bill” Jones, a Duluth auto enthusiast, had purchased a $5,000 Benoist plane designed to take off and land on the water. Jones had no flying experience, so the plane was shipped to Duluth (unassembled) along with mechanic James Smith and Tony Jannus, holder of many early flight records and perhaps the most well-known pilot in the U.S. at the time. Smith would assemble the plane; Jannus would teach Jones how to fly it. Two days later prominent Duluthians were lining up to be passengers, including Duluth News Tribune cartoonist R. D. Handy, Oliver Mining attorney (and Lark chairman) Archie Banning, Barnes’ wife, and their daughter Gertrude. Jones took a turn as well, and during this flight Jannus piloted the plane below the top span of Duluth’s Aerial Transfer Bridge, becoming the first pilot to pass under the bridge. Afterwards, hardly a day went by when local newspapers did not feature at least one story about the plane. Jannus became a local celebrity, and the papers featured stories of his previous record-setting flights and his future plans to fly across the Atlantic Ocean. The festival itself was a great success, even though most weekend weather prevented some activities and grounded the Lark. Besides the flying boat, the carnival featured all sort of watercraft races, swimming races, log rolling, “water baseball,” “canoe wrestling,” life-saving exhibitions, and races between motor boats and the Lark. In case of foul weather, a vaudeville show would be held at the Commercial Club which, along with other civic groups, helped the Boat Club organizing the event. Fireworks would conclude the event each night. The flying was better the next day, and Jannus entertained crowds with stunt flying, performing figure eights and other acrobatic maneuvers with Jones as passenger. At one point the engine failed and Jannus had to set the plane down, but he and Jones were never in much danger: on that flight, and many others, the Lark rarely flew more than a few feet off the ground. On July 1, the News Tribune announced that Jones and pilot Hugh Robinson—a principal designer of the Benoist Model XIV—would enter the Lark in a 900-mile flying boat race over Lake Michigan and Lake Huron from Chicago to Detroit that was scheduled to begin on July 8. While the Lark was away, William H. Bleakely would take over flying exhibitions during the Lark festival, flying a Benoit hydro-aeroplane—a different model than the Lark—which Jannus had flown on his record-setting flight from Omaha to New Orleans. The first night of the Independence Day weekend was a bust. “Storm Spoils Lark o’ Lake” cried the News Tribune. Festivities were forced inside the Boat Club’s headquarters—normally reserved for members only—where the Third Regiment Band played dance numbers. Because of driving rains, attempts to set of the fireworks were abandoned, and the Lark’s exhibition was canceled. When Robinson eventually attempted to get the plane higher in the air—“not wishing to disappoint the crowd,” he explained—the wind suddenly lifted the left wing. Robinson was not able to right it before the right wing hit the water and he, Ingalls, and the Lark were tossed into drink. Motorboats stationed for just such an event raced to their rescue, pulling the stunned men out of the water. Ingalls was bruised, Robinson nearly blinded by a snapped brace, and the Lark was wrecked. Luckily for Lark festival, another plane was already on its way. But Robinson, Ingalls, and Jones could not get the Lark repaired in time for the race in Chicago. Jannus had qualified and won the top starting position, but ran into the same luck Robinson had suffered a few days earlier. He and mechanic Paul McCullough, along with crews from two other pilots, were caught in a squall before they could even get out of Chicago. Jannus and McCullough had to be rescued, and their plane abandoned. The Lark’s replacement arrived on July 8, but pilot William H. Bleakely did not. Instead, the hydro-aeroplane was accompanied by pilot Earl Wymark (also spelled “Weymark”). The hydro-aeroplane was much different than the Lark. The bulk of the Lark’s motor—and therefore its weight—was in the front, and it was pushed by a rear propellor; the hydro-aeroplane’s motor was in the center and it was pulled by a front propellor. Weather prevented boat races and the new plane from flying on both Friday and Saturday, but the night’s main attraction—a parade celebrating Duluth’s industries—was reportedly well attended. The following Tuesday, festival organizers announced that the Boat Club set off the previous weekend’s unlaunched fireworks and the hydro-aeroplane would make an exhibition flight. A few days later the News Tribune reported that Jannus was back in town, repairing the Lark, and would give a demonstration flight on Saturday the 19th. Jannus also took the stick during the Friday evening flight of the hydro-aeroplane. Newspapers called it the best flying exhibition so far. He flew for over an hour, at least once reaching an altitude of 1,000 feet as he “gave a demonstration of all the tricks of the airmen.” He circled the Boat Club, flew over the aerial bridge, cruised the harbor, and buzzed the business district before landing. Newspapers did not mention if the Lark flew on Saturday the 19th as promised, but it was in the air by the following Monday. 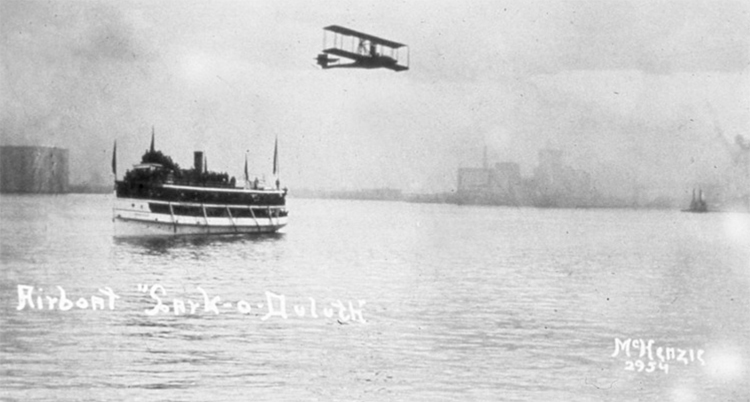 Because of repairs, the name under the wing now read simply “of DU.” Jannus accompanied W. D. Jones on several practice flights, and on Thursday, with Barnes in the passenger seat, the pilot lifted the Lark to an altitude of 300 feet and cruised from the Boat Club’s headquarters to its Spirit Lake branch and back. Jannus and the Lark made more exhibition flights July 25 and 26, the fifth “Lark” weekend of the summer. The Chisholm Elk’s Club was so impressed by Wymark—particularly because he had drawn “immense crowds” at the festival and flew his hydro-aeroplane in conditions that safety-minded Jannus would not fly the Lark—they invited him to attempt the first flights on the Iron Range, taking off and landing on Longyear Lake. The event was scheduled for August 2, the final day of the Duluth festival. It did not go well. Engine trouble on the second flight of the day forced the plane down, and it ended up on the bottom of Longyear Lake in eight feet of water. It was later salvaged and sent back to St. Louis for repairs. “Lark o’ the Lake” promoters promised that the last weekend would be the summer’s best, and they did not disappoint. The feature event was the Friday night “Venetian Fete,” reviving the 1907 event that started the summer carnivals. Patterned after water carnivals in Venice, Italy, the event was essentially a nighttime “parade” of hundreds of watercraft—small sailboats, rowboats, and canoes—lavishly festooned and illuminated with Japanese lanterns. More than 5,000 Duluthians and visitors turned out to see the fete. Among the decorated boats were replicas of the aerial bridge and the Lark of Duluth. Despite “perfect weather conditions,” the newspaper did not report if the Lark made a flight that weekend, although it was scheduled to perform with Jannus and Jones aboard. The paper did mention two “aquaplane exhibitions” by Louis Ardouin, David Wisted, and Whitney Wall, Jr., but left out any details, including any information of the planes they flew. The Lark o’ the Lake festival came to a close with an automobile parade.